Georgia captain Mamuka Gorgodze scores his team's first try in their 17-10 win over Tonga in Gloucester. 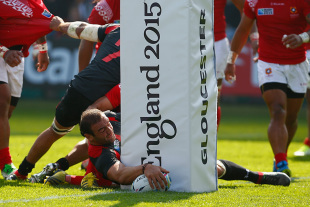 Georgia claimed only the third win in their World Cup history as captain Mamuka Gorgodze inspired them to victory over Pool C rivals Tonga at Kingsholm. The Toulon back-row forward epitomised Georgia's unrelenting spirit and physical prowess by powering over for a first-half try as a 17-10 triumph meant they added Tonga to previous World Cup scalps Namibia eight years ago and Romania in 2011. But this was undoubtedly their most satisfying World Cup success, with flanker Giorgi Tkhilaishvili sealing the deal when he touched down after 57 minutes, while full-back Merab Kvirikashvili kicked a penalty and two conversions. Tonga replied with a Kurt Morath penalty, while he also converted wing Fetu'u Vainilo's 72nd-minute try - he became Tonga's record Test try scorer in the process - yet Georgia deservedly held on after Kvirikashvili was sin-binned during the dying minutes for repeated offside. It was also a day to savour for 18-year-old Georgia scrum-half Vasil Lobzhanidze, who became the youngest player ever to feature in the tournament. Tonga took an early lead through Morath's penalty, but they could have few complaints about the result after struggling tactically and also lacking the attacking flair to break down a Georgia defence that put in a relentless tackling shift. The Gloucester crowd of just over 14,000 relished such a hard-working effort, and Georgia will return to Kingsholm in six days' time for an appointment with Argentina, having already made their mark at World Cup 2015. With world champions New Zealand overwhelming favourites to win the group and Argentina also seemingly nailed on for a quarter-final spot, Tonga knew they could not afford an opening weekend defeat against a team placed just below them in rugby union's official world rankings. But although Morath kicked Tonga ahead, Georgia's forwards quickly developed a healthy appetite for battle, with Gorgodze making considerable headway inside opposition territory. Kvirikashvili should have landed an equalising penalty three minutes later, but he missed a short-range chance, only to make amends shortly afterwards and end an opening quarter that Georgia shaded in terms of territory and endeavour. Tonga could not get their game going, being frustrated by a combination of poor decision-making and sloppy handling, but Georgia had rumbled them, primarily through consistently-impressive scrummaging work by props Mikheil Nariashvili and Davit Zirakashvili. And Georgia's forwards laid the foundation for a 28th-minute try, driving Tonga backwards through some excellent phase-play that ultimately resulted in Gorgodze powering over and claiming a touchdown that referee Nigel Owens awarded following consultation with television match official George Ayoub. Kvirikashvili added the conversion to open up a 10-3 lead, and despite Tonga pressing for an equalising try as half-time approached, number eight Vili Ma'afu was denied a try after Owens ruled a forward pass from an attacking lineout, and Georgia retained their seven-point advantage. The third quarter proved to be another tale of frustration for Tonga, as they again floundered on Georgia's excellent defensive organisation, and they would have fallen further behind had Kvirikashvili not missed another penalty. With Lobzhanidze sniping around the forward fringes, Tonga found themselves under sustained pressure, and their defence was shredded following a sharp Kvirikashvili break after 57 minutes. The full-back almost sent supporting lock Giorgi Nemsadze clear in space, but Georgia did not lose composure when he was hauled down, and quickly recycled possession resulted in Tkhilaishvili enjoying an unhindered run to score. Kvirikashvili added the conversion, and Georgia were almost out of sight, having thrown down the challenge to Tonga and seeing their opponents offer little in reply. Even when a clever Morath kick bisected Georgia's defence, Tonga failed to capitalise as centre Siale Piutau was unable to ground the ball as it rolled agonisingly out of his grasp, which summed up the South Sea Islanders' day.